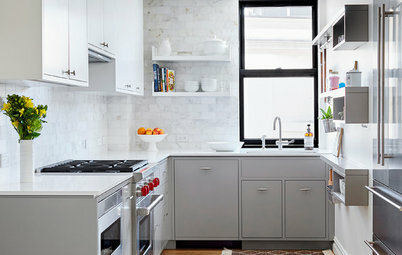 Houzz Associate Editor. 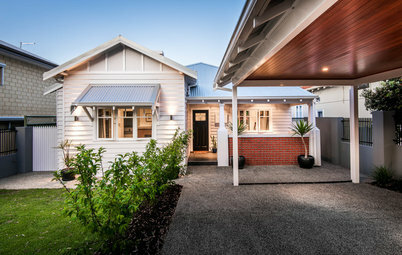 Passionate about creative homes and the people behind them. 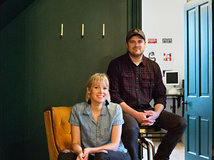 Loves thoughtful design, improving her family's 1950s fixer-upper and VW buses. Former designer at the San Jose Mercury News. 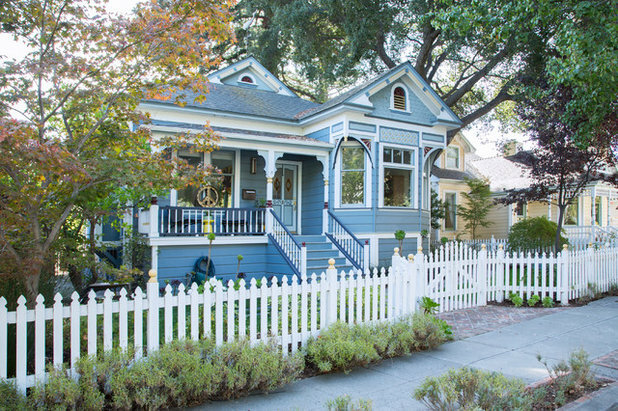 After 12 years of living with a cramped kitchen layout, Martha and Mario Queiroz were ready to make a big change to their 1892 Queen Anne Victorian cottage in Los Gatos, California. 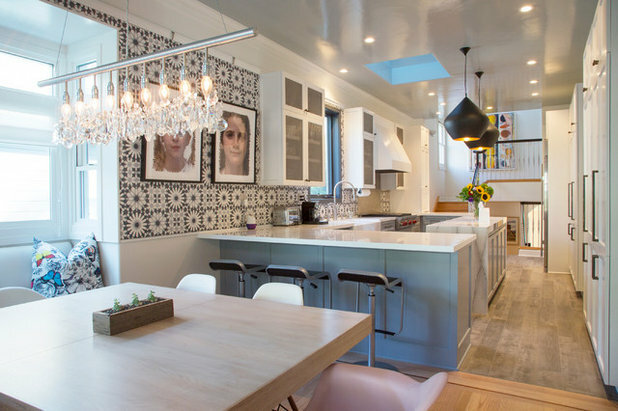 A desire for more natural light and a more inviting floor plan prompted the couple to gut the main floor and open up a dark and dated kitchen that had what Martha describes as a quirky layout. “I had been dreaming about what we could do with our space for years, and I love spaces that reflect the owner’s personality,” she says. 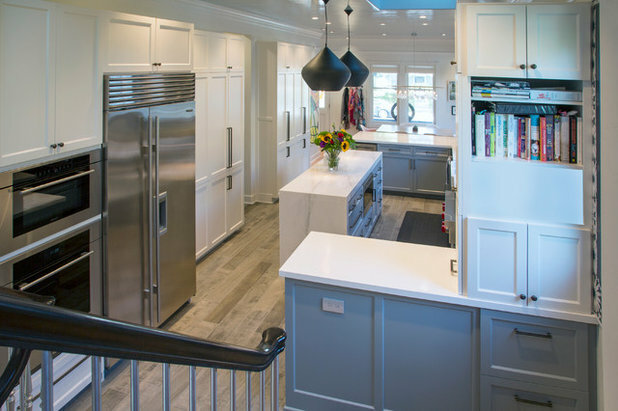 The couple started their nine-month-long remodel in October 2015, working closely with interior designer Pamela Pennington and general contractors from DeMattei Construction. 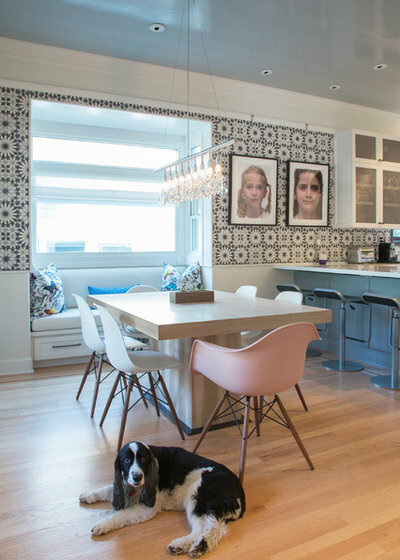 One big step in the process was removing a non-load-bearing wall between the kitchen and dining room to make one open space that improved the flow of the main floor. 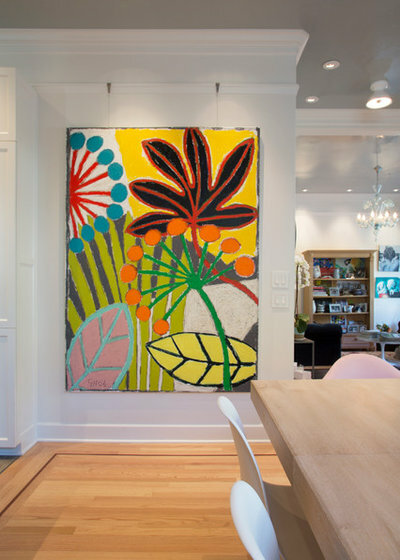 The home now has a blend of modern updates with traditional touches, and highlights the well-traveled couple’s love of art. 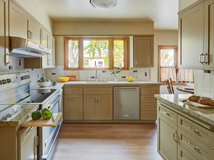 During demolition, a contractor from DeMattei took the existing cherry cabinets and reused them for a different project. 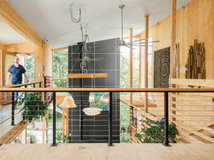 The main floor was taken down to the studs, and the family lived in the house during construction, setting up a temporary kitchen in their den. 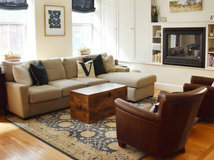 AFTER: Martha’s design vision for the main floor was to create a more functional, light-filled space. “Taking that wall down makes it so much easier to interact with people when we entertain now,” she says. With the open floor plan, everyone in the space can now easily see and converse with one another. “Before, if someone was working at the dining room table, they were isolated from whomever was in the kitchen and vice versa,” she adds. The existing coffered ceilings had to be removed, as they stopped where the wall had been. The team smoothed out the ceilings and painted them a high-shine gray. 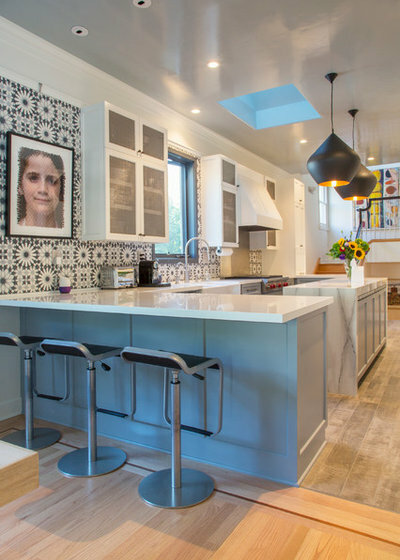 Another striking feature of the new kitchen is the cement tile accent wall that runs the length of the main floor. 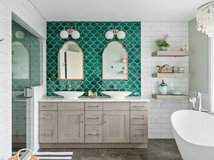 Martha fell in love with the pattern of the handcrafted Eastern Promise tile designs by Martyn Lawrence Bullard for Ann Sacks and alternated three of them: Fez, Marrakesh and Tangier. The tiles are handmade in Morocco. “Oddly enough, the pattern on the cement tiles reminds me of Victorian tin ceiling tiles,” Martha says. One other major change the homeowners made to the main floor was to add a bay window and custom seat as part of a bump-out in the dining area. They were created out of what previously was just a flat wall with a small window. 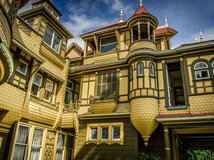 To implement the structural change to the floor joists and the home’s Victorian exterior, they received approval from the Los Gatos Historic Preservation Committee. 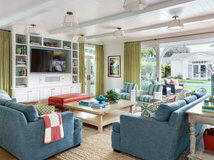 The bay window was added “to make the space appear larger and lighter, and to add the possibility of a two-person seat at one end when the custom table is extended and pushed up to the bay window banquette,” Martha says. Graphic designer J.W. Fry created the woven portraits of the couple’s daughters in 2006. The custom cerused walnut dining table was inspired by a Calligaris table and was made by John Cortese of Seventh & 7th Designs in San Diego. 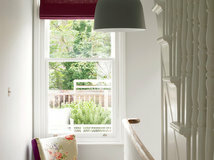 The extendable table can seat up to 12 when it’s pushed against the bay window seat. “When needed, the table can be extended with two leaves. 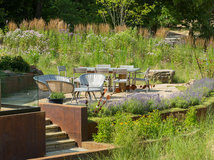 That is incredible, especially considering the small size of the dining area,” Martha says. “We love to have our friends, neighbors and our teenage daughters’ friends over for meals and parties, so our dining space needed to be able to seat a bigger group. The family’s English springer spaniel, Cody, gets comfortable on the original refinished red oak floors. 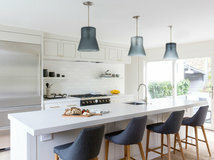 “I wanted the rest of the kitchen to have a more modern vibe, thus the linear hardware, waterfall-edge marble island, high-arch faucet, oversized pendant lights and PentalQuartz counters,” Martha says. 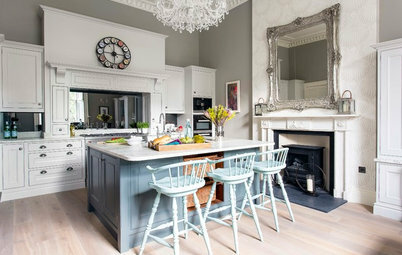 The Shaker cabinets, farmhouse sink and picture rail are more in line with the original Victorian architectural design features. The painting in the stairwell is by a Barcelona artist and is from the Affordable Art Fair, which is where they purchased a lot of their art when they lived in Europe. 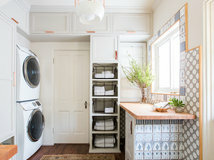 “All of the storage is so well-thought-out that there is a place for everything and then some,” Martha says. 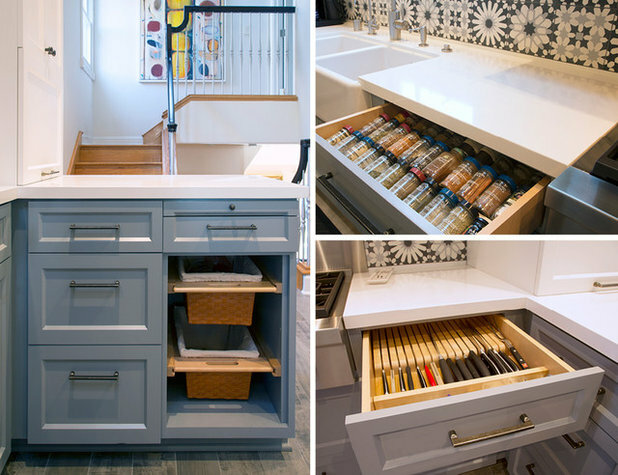 “It is so easy to cook, because all of my materials are so easily accessible.” She worked closely with Pamela Pennington on the details, such as having a wood knife holder with prescribed slots, a spice drawer and pullout drawers for fruit and bread. 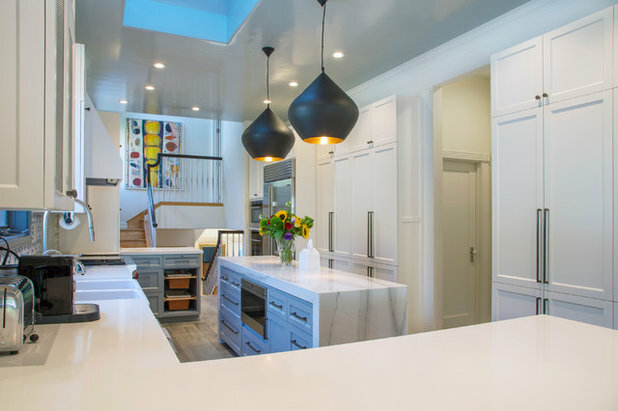 For the island, the couple chose a thick Calacatta Lincoln marble countertop. They also added a skylight to introduce more natural light. For the upper-cabinet fronts, they went with mesh wire. 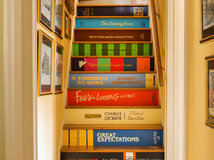 “I had seen something similar on Houzz. They actually are a bit sparkly, or light-reflective, and I like them even much more than I anticipated,” Martha says. This colorful painting is by American artist Gordon Hopkins, who lives in Belgium. The kitchen floors are porcelain with a wood-like look. This view from the stairs to the front of the house shows the improved flow between the updated kitchen and the front dining area. The parlor in the front of the house was often overlooked prior to the remodel, but now, with the improved flow, the family uses it much more. The well-loved Ikea leather sofa is a favorite place for Cody to nap and look out at the street filled with other Victorians. “I like to use the space to read the newspaper on Sunday mornings. 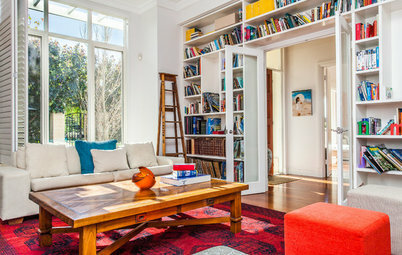 In the evenings, this is also a space to entertain with drinks. Julia practices clarinet in here too,” Martha says. 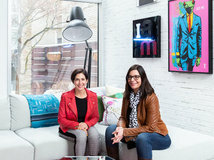 The space is decorated with several original art pieces done by the couple’s other daughter, Isabel, who is currently studying fine art at college. 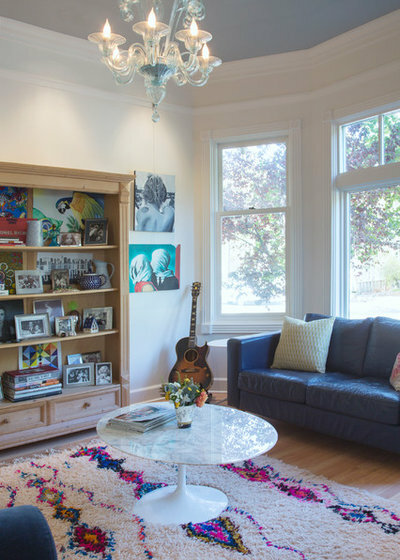 The couple had the wood china cabinet when they lived in Germany and moved with it to the U.S. “I removed the glass doors and now use it to display family photos, meaningful art from Isabel and travel mementos, including a ceramic horse made from an artist friend, Hildy Licht, as a gift,” she says. Martha owns a horse that she rides regularly at a nearby horse ranch. 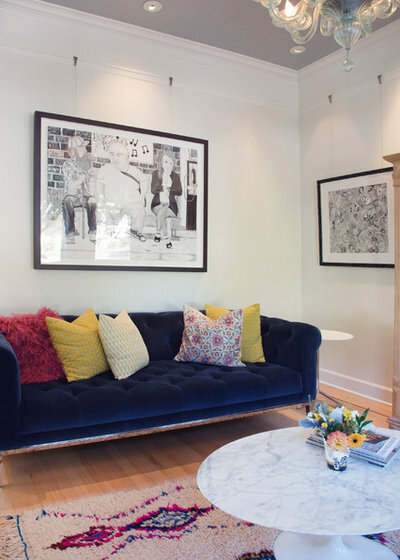 The couple added a picture rail from Gallery System and use it to display and occasionally swap out Isabel’s original artwork. New ceiling can lights were also added. Small adjustable-height side tables are occasionally used for working on a laptop. 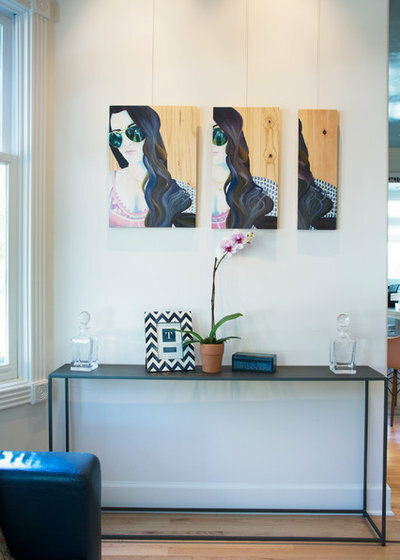 A three-part painting by Isabel also hangs from the picture rail. 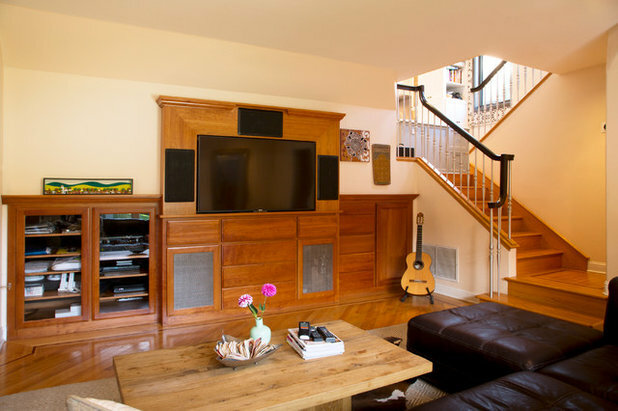 The lower-floor den features cherrywood cabinetry added by the previous homeowner. 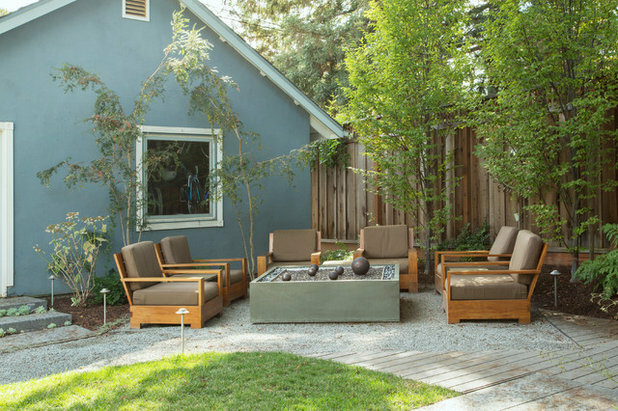 This space leads out to the backyard. 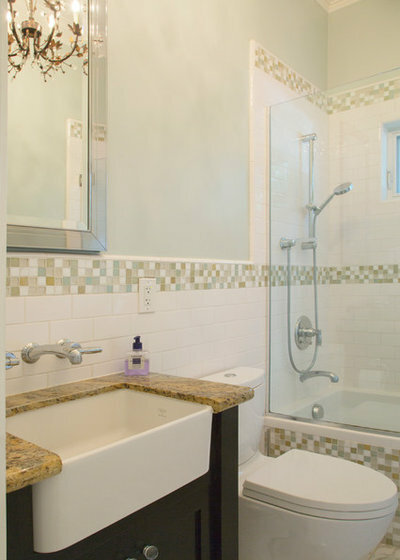 A main-floor bathroom between the daughters’ bedrooms was updated in 2009. 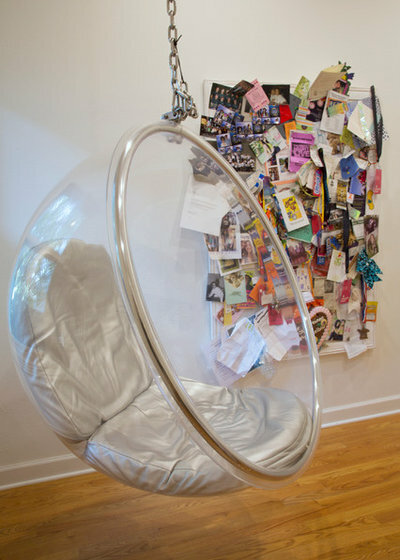 The room of 19-year-old Isabel features a hanging bubble chair and a large bulletin board, which corrals mementos. 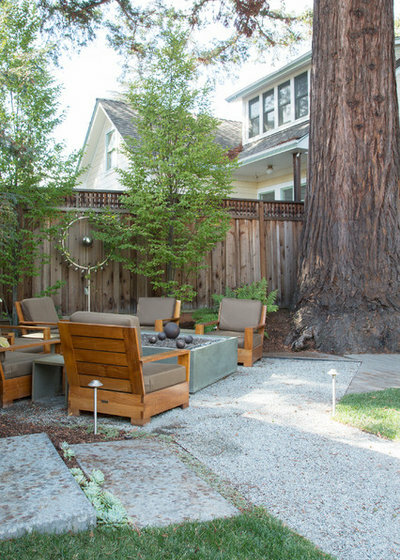 The couple’s master bedroom has a nice view of the Santa Cruz Mountains and includes a handmade area rug they bought in Sardinia. The accent pillow in the middle of the bed is a memento from Oahu, Hawaii. 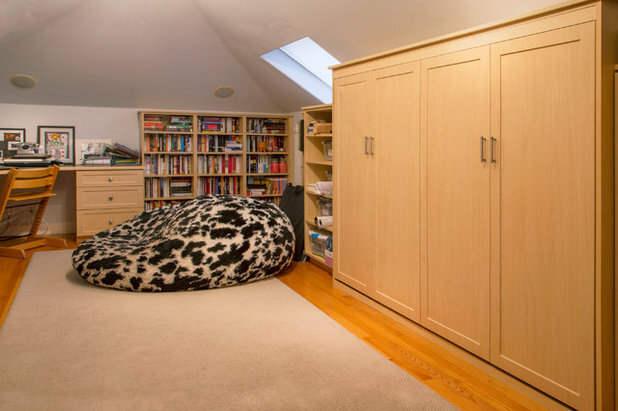 Above the master bedroom is a loft used as a guest space and home office. 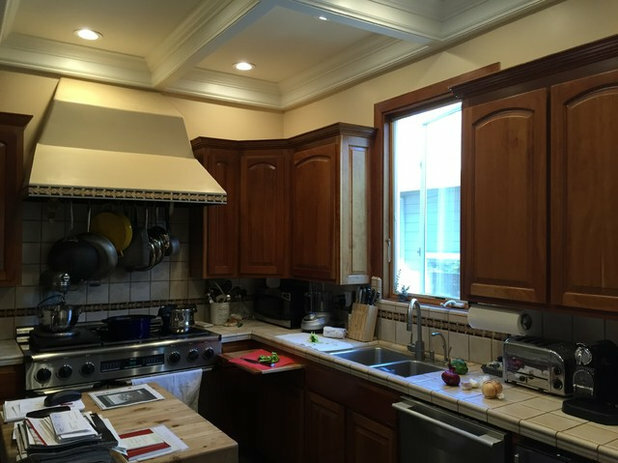 Custom cabinetry installed by a company in Santa Cruz (now closed) lines this space. The oversize beanbag from London is another favorite spot for Cody to sleep. 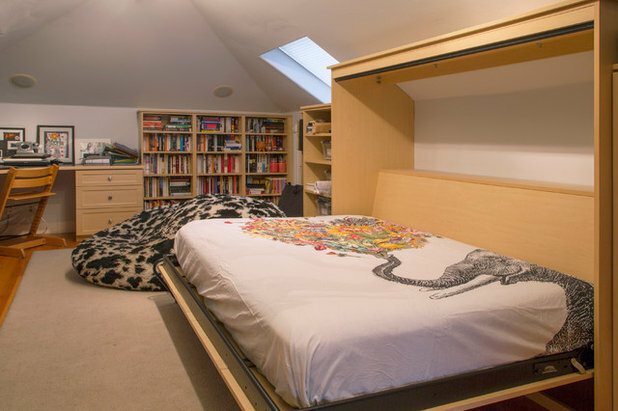 The cabinetry includes a full-size Murphy bed that folds out to provide a sleeping space for guests. Having the outdoor kitchen area came in handy during the kitchen remodel. 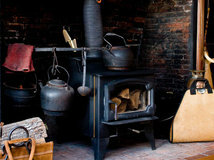 “We set up a temporary kitchen downstairs, including folding tables, an electric griddle, microwave, countertop oven, a hot plate burner, full size Sub-Zero fridge and storage bins for storing food,” Martha says. “It took time to set up the temporary kitchen, but it took some of the pain of living in a construction zone away. 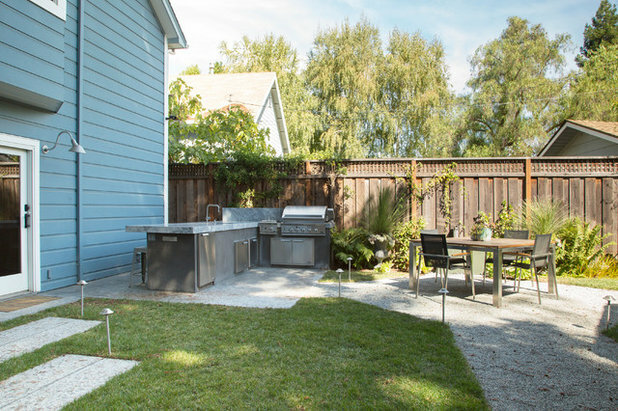 Also, having the outdoor sink and being able to use the grill came in handy.” The family had one set of everything — cups, silverware — and one frying pan, and washed dishes in the laundry room sink. 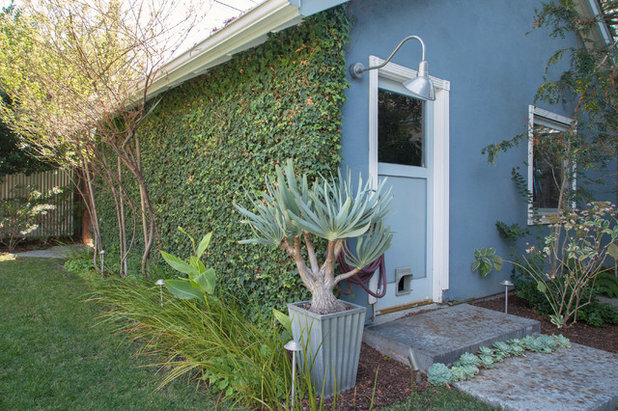 The front does not feature a driveway; the ivy-covered detached garage is accessed from a rear alley. Succulents are planted in front of each stair tread on the path that leads from the garage to the house. 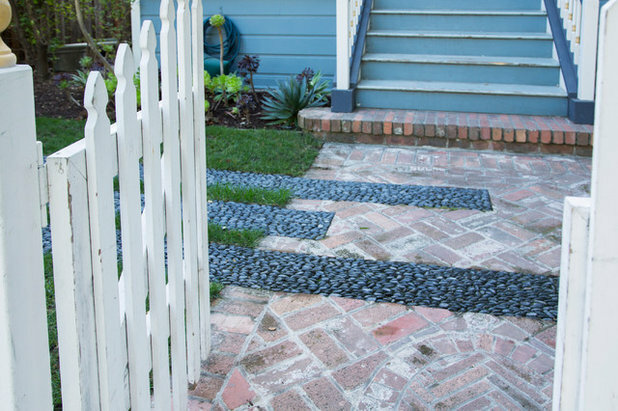 Embedded stones add a modern touch to an existing traditional brick pathway at the front of the home. The door, including the ringer, is original to the house. 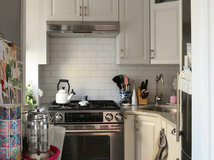 Martha is pictured in her updated kitchen. 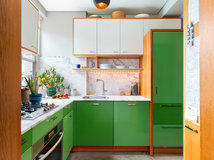 My Houzz is a series in which we visit and photograph creative, personality-filled homes and the people who inhabit them. 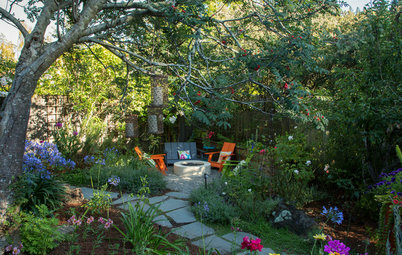 Share your home with us and see more projects. 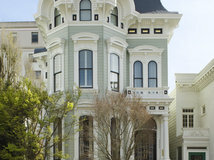 Design Debate: Should You Modernize a Historic Home? I really love the wall art and the floor rug. 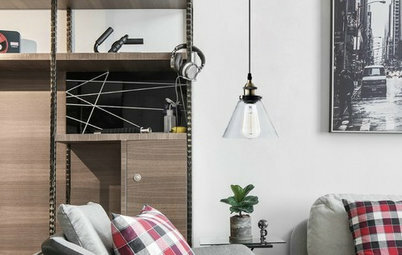 They give off a relaxingly creative feel to the room. 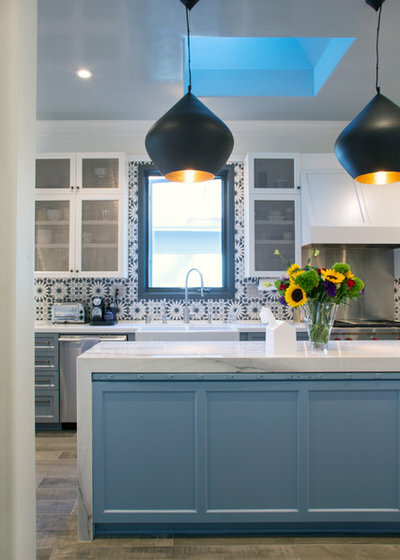 the light, and kitchen tile is fabulous, especially complimenting all the art. Love , Love!